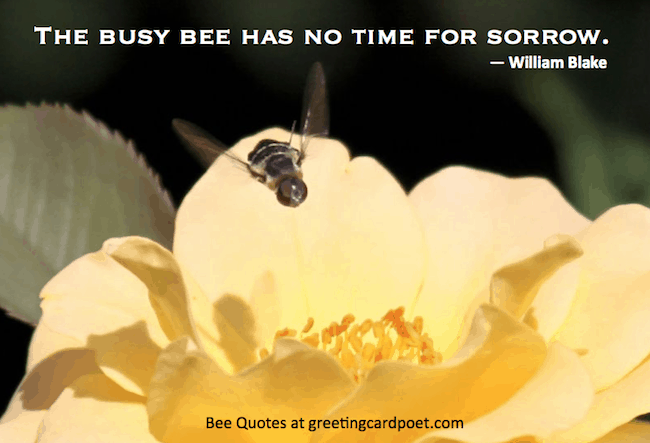 Our collection of bee quotes and sayings will keep you as busy as a bee. When you buy just 16 ounces of honey, there are a thousand bees behind it that traveled over a hundred thousand miles and visited more than 4.5 million flowers. It is no wonder that many great men and women have been inspired to study these beautiful creatures and write amazing phrases, poems and songs on them. It is not just about their beauty and inspiring hard work, bees are also essential for the human existence. Honey bees are so important to humans that they are the most studied creature, second only to human beings. Here are some beautiful bee quotes from some famous folks. Words are like bees – some create honey and others leave a sting. For bees, the flower is the fountain of life/For flowers, the bee is the messenger of love. They make me regret I am not a bee. [L]et us linger awhile in the wonderful old Lilac walk. It is a glory of tender green and shaded amethyst and grateful hum of bees, the very voice of Spring. Don’t wear perfume in the garden — unless you want to be pollinated by bees. Bee to the blossom, moth to the flame; Each to his passion; what’s in a name? Listen to the bees and let them guide you. He is not worthy of the honey-comb/That shuns the hives because the bees have stings. I don’t like to hear cut and dried sermons. No – when I hear a man preach, I like to see him act as if he were fighting bees. The siren heralds a friend, the bee a stranger. Bees work for man, and yet they never bruise/Their Master’s flower, but leave it having done/As fair as ever and as fit to use/So both the flower doth stay and honey run. Float like a butterfly, sting like a bee – his hands can’t hit what his eyes can’t see. 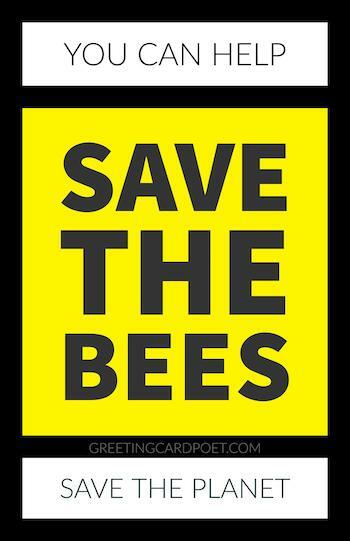 Tips for how to help save bees. For so work the honey bees, creatures that by a rule in nature teach the act of order to a peopled kingdom. We’re all busy little bees, full of stings, making honey day and night, aren’t we honey? The secret of my health is applying honey inside and oil outside. Honeybees pollinate 80 percent of the the United States’ insect crops – over $20 billion worth of crops each year – according to the U.S. Department of Agriculture estimates. Well if you have a queen and a group of independent-minded bees that split off from the rest of the hive and look for another place to live, then you’ve got a swarm. Our mother said she was like Mary, with her heart on the outside of her chest. It is the peculiar nature of the world to go on spinning no matter what sort of heartbreak is happening. Most people don’t have any idea about all the complicated life going on inside a hive. Bees have a secret life we don’t know anything about. no matter how much you whine about it. You know that feeling where everything feels right? Where you don’t have to worry about tomorrow or yesterday, where you feel safe and know you’re doing the best you can? There’s a word for that, it’s called love. L-O-V-E. Okay. But when I’m at the bee, and they tell me to spell some little fish from Australia or some weird bacteria on the moon, we’re going to wish we’d done a little bit more rotemorizing and not so much essay reading. If you don’t mind me saying. I’m just getting better and better. It’s just like a bunch of worker bees protecting the king bee, because I’m not a queen bee. I’m a king bee. To be successful, one has to be one of three bees: the queen bee, the hardest working bee, or the bee that does not fit in. Just as the queen bee, the highest-ranking, peerless creature of her hive, is surrounded by lowly drones to please her, whereas the workers produce honey, the same way is the one who sits on the throne an equal only to himself, and no one’s companion. critics do, they sound like sewing machines. If you have suggestions for additions to our bee quotes, please let us know via the contact page. Thanks!